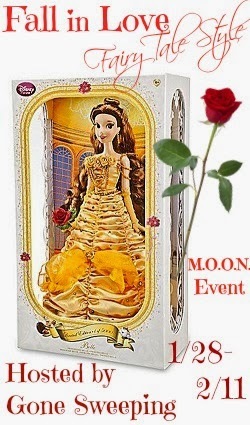 "With its intricate details inspired by 18th century French fashion, this beautifully designed Belle doll captures the essence of the Beauty that turned a Beast into a handsome prince. The elegance of her golden satin dress is enhanced by the intricate layers of gathering, each punctuated by a shimmering golden rhinestone. The bodice is accented with five perfect golden roses, each capped by a single glittering stone, and gleaming golden jeweled strands which add to the magical look befitting a Disney Princess. A delicate swag of luxurious chiffon held in place by gorgeous golden roses adds the perfect touch to an exquisite gown. Belle holds a single glittering red rose; a fitting testament to the power of true love."